Changing career can be like tuning an instrument for the first time. At the start, stressful notes abound, the logistics are fiddly, and there’s no guarantee, that when the last tuning peg is turned, you’ll see a satisfying return on investment. But, surely the risk of creating a cacophony is better than standing stationary, pondering, ‘what if’? For Anjuli Deo, the instrument of change was a full-time MBA from Copenhagen Business School in Denmark. With an educational background in music—she graduated with a BA in voice performance from Loyola Marymount University and a Master of Music from Brooklyn College in the US—the transition was unorthodox. After completing her music education, Anjuli toured as a classical opera singer. She built up a resumé of air miles over eight years, performing live for crowds of more than 1,000 people in cities like New York, Los Angeles, and Rome. During her globetrotting ventures, the seed for her future business endeavors was planted. She doubled up her workload, peering under the curtain of the public relations and marketing side of music. Among her roles was the management of directors and financial investors, aiming to align both the commercial and artistic objectives of the music industry. “I reached a point in my pursuit of music where I was taking a step back, to ask myself what I really wanted,” she says. “The answer was, that I wanted to make a positive impact in the world and to do so through music. Anjuli wanted an MBA program that tied in with her own ambitions to maximize return on investment. Working and living in New York, she first thought about attending NYU Stern School of Business. But, after weighing up the benefits of an international experience, it became clear that Anjuli and Copenhagen Business School sang from the same hymn sheet. “The school and the program stood out to me for three reasons,” she says. “Firstly, the strong focus the school has on social responsibility; which I saw as key to any program I applied to. “Secondly, the leadership program was of great interest, not solely for the purpose of one day running an organization, but because I strongly believe in self-development and how this will improve my success, whether I am at the top, middle, or bottom of an organization’s infrastructure. The formula for forming business relations is a two-way street—you get out what you put in. The same can be said for MBA candidates transitioning into the classroom. Transferable skills are impeccable to one’s overall development. “Being a performer gives you many great attributes,” says Anjuli, “being calm under pressure, learning to adapt quickly to change, actually performing and connecting with your audience—something you do so often in a corporate environment with your colleagues. All great performers need a stage to stand on. For Anjuli, that stage was erected quickly through the Copenhagen MBA, when she landed a graduate position in Denmark with Jabra, a Danish consumer electronics company. The Copenhagen MBA has a strong history of alumni finding roles in Denmark after their degree—80% of 2014’s cohort landed jobs in the country—and the b-school has the largest MBA network in Scandinavia, with 14,000 alumni representing 80 countries. Anjuli took the fabled MBA career triple jump—changing industry, role, and location—after graduation. 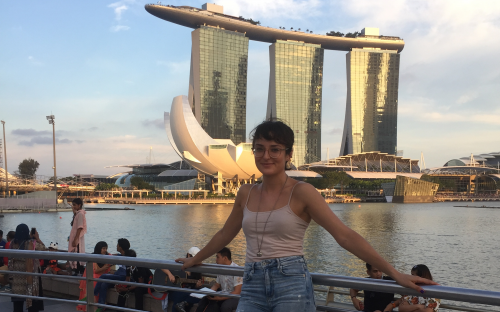 Incorporating the knowledge imbibed during her MBA, she now works for Jabra’s Asia-Pacific regional marketing team, in Singapore. It is no easy feat transitioning into an industry that is radically different to the one you are used to. But Anjuli’s move from the arts, to Copenhagen Business School and then to Jabra, seems seamless. “It is difficult to change careers,” she acknowledges, “you do a lot of smiling and nodding, pretending you understand all the jargon people are talking about, and then feverishly googling all the words or abbreviations you can when you get a chance alone. “[However], if you are looking to shift gears into a new career,” she concludes, “all I can say is go for it. The business world needs more people like that, people who don’t take the standard for granted.